Residential Garage Door Openers - Grove City Garage Door®Inc. Grove City Garage Door Inc. carries LiftMaster and Chamberlain garage door openers. We sell the garage door openers with one keyless entry, two remotes, safety sensors, and the wall button. Grove City Garage Door Inc. is a Factory Authorized Dealer of Liftmaster garage door openers. 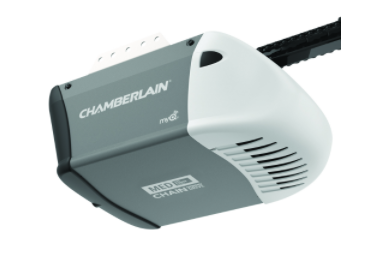 Chamberlain garage door openers are made by Liftmaster. Belt drive garage door opener, quiet durability, wifi capable, MYQ technology. Most recommended opener in the market. Comes with two remotes, keyless entry, and wall button. Chain drive garage door opener that is wifi compatible, has MYQ on board. Comes with two remotes, keyless entry, and wall button. Smooth efficient operation. Budget friendly pick. Great opener all around. Comes with two remotes, keyless entry, and wall button. This is a bare basic chain opener that is affordable for any budget! MYQ compatible with a gateway.